To help make it easier to build Kubernetes applications, Red Hat and the Kubernetes open source community today share the Operator Framework — an open source toolkit designed to manage Kubernetes native applications, called Operators, in a more effective, automated, and scalable way. You may be familiar with Operators from the concept’s introduction in 2016. An Operator is a method of packaging, deploying and managing a Kubernetes application. A Kubernetes application is an application that is both deployed on Kubernetes and managed using the Kubernetes APIs and kubectl tooling. To be able to make the most of Kubernetes, you need a set of cohesive APIs to extend in order to service and manage your applications that run on Kubernetes. You can think of Operators as the runtime that manages this type of application on Kubernetes. Conceptually, an Operator takes human operational knowledge and encodes it into software that is more easily packaged and shared with consumers. Think of an Operator as an extension of the software vendor’s engineering team that watches over your Kubernetes environment and uses its current state to make decisions in milliseconds. Operators follow a [maturity model] from basic to having specific logic for an application. Advanced Operators are designed to handle upgrades seamlessly, react to failures automatically, and not take shortcuts, like skipping a software backup process to save time. The pieces that are now being launched as the Operator Framework are the culmination of the years of work and experience of our team in building Operators. We’ve seen that Operators’ capabilities differ in sophistication depending on how much intelligence has been added into the implementation logic of the Operator itself. We’ve also learned that the creation of an Operator typically starts by automating an application’s installation and self-service provisioning capabilities, and then evolves to take on more complex automation. We believe that the new Operator Framework represents the next big step for Kubernetes by using a baseline of leading practices to help lower the application development barrier on Kubernetes. The project delivers a software development kit (SDK) and the ability to manage app installs and updates by using the lifecycle management mechanism, while enabling administrators to exercise operator capabilities on any Kubernetes cluster. The SDK provides the tools to build, test and package Operators. Initially, the SDK facilitates the marriage of an application’s business logic (for example, how to scale, upgrade, or backup) with the Kubernetes API to execute those operations. Over time, the SDK can allow engineers to make applications smarter and have the user experience of cloud services. Leading practices and code patterns that are shared across Operators are included in the SDK to help prevent reinventing the wheel. Once built, Operators need to be deployed on a Kubernetes cluster. The Operator Lifecycle Manager is the backplane that facilitates management of operators on a Kubernetes cluster. With it, administrators can control what Operators are available in what namespaces and who can interact with running Operators. They can also manage the overall lifecycle of Operators and their resources, such as triggering updates to both an Operator and its resources. Simple, stateless applications can leverage the Lifecycle Management features of the Operator Framework without writing any code by using a generic Operator (for example, the Helm Operator). However, complex and stateful applications are where an Operator can shine. The cloud-like capabilities that are encoded into the Operator code can provide an advanced user experience, automating such features as updates, backups and scaling. In a future version, the Operator Framework will also include the ability to meter application usage – a Kubernetes first, which provides extensions for central IT teams to budget and for software vendors providing commercial software. Operator Metering is designed to tie into the cluster’s CPU and memory reporting, as well as calculate IaaS cost and customized metrics like licensing. We are actively working on Metering and it will be open-sourced and join the Framework in the coming months. If you are a community member, builder, consumer of applications, or a user of Kubernetes overall, the Operator Framework offers a number of benefits. Today, there is often a high barrier to entry when it comes to building Kubernetes applications. There are a substantial number of pre-existing dependencies and assumptions, many of which may require experience and technical knowledge. At the same time, application consumers often do not want their services to be siloed across IT footprints with disparate management capabilities (for example, departments with differing tools for auditing, notification, metering, and so on). The Operator Framework aims to address these points by helping to bring the expertise and knowledge of the Kubernetes community together in a single project that, when used as a standard application format, can make it easier to build applications for Kubernetes. By sharing this Framework with the community, we hope to enable an ecosystem of builders to more easily create their applications on Kubernetes via a common method and also provide a standardized set of tools to build consistent applications. We believe a proper extension mechanism to Kubernetes shouldn’t be built without the community. To this end, Red Hat has proposed a "platform-dev" Special Interest Group that aligns well with the existing kube-builder project from Google and we look forward to working with other industry leaders should this group come to fruition. "We are working together with Red Hat and the broader Kubernetes community to help enable this ecosystem with an easier way to create and operate their applications on Kubernetes," said Phillip Wittrock, Software Engineer at Google, Kubernetes community member, and member of the Kubernetes steering committee. "By working together on platform development tools, we strive to make Kubernetes the foundation of choice for container-native apps - no matter where they reside." For consumers of applications across the hybrid cloud, keeping those applications up to date as new versions become available is of supreme importance, both for security reasons and for managing the applications’ lifecycles and other needs. 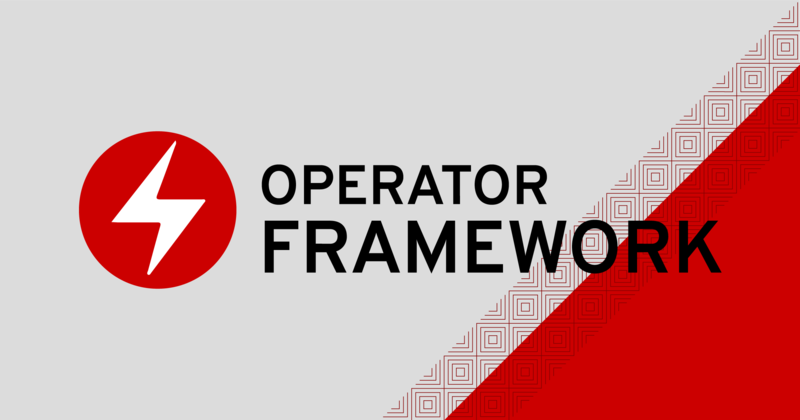 The Operator Framework helps address these user requirements, aiding in the creation of cloud-native applications that are easier to consume, to keep updated, and to secure. Learn more about the Operator Framework at https://github.com/operator-framework. A special thanks to the Kubernetes community for working alongside us. Take a test drive with the code-to-cluster reference example. If you are at KubeCon 2018 in Europe, join our morning keynote on Thursday, May 3 to learn more about the framework. Can’t attend live? We’ll host an OpenShift Commons briefing on May 23 at 9 AM PT for a deeper dive on all things Operators.